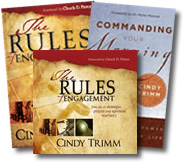 Dr. Cindy Trimm- Commanding Your Morning and The Rules of Engagement! Many people lack the confidence to make a stand against the powers of Satan. The Rules of Engagement contains bold, in-your-face principles for strategic prayer and spiritual warfare and makes getting in the devil's face and defeating his strategies a possibility for everyone. It includes declarations for engaging the enemy armed with God's power and authority to defeat him and emerge a conqueror. It helps the reader to recognize the principalities and subordinate spirits that operate in the kingdom of darkness, and it shows the reader how to expose the weapons of warfare and be victorious. Purchase Now! There is a spiritual battle going on, and prayer warrior and intercessor Cindy Trimm has given you a manual to wage effective warfare. The Rules of Engagement helps you recognize the spirits that operate in the kingdom of darkness and gives you declarations for engaging them armed with God's power and authority. · Strongholds of the enemy are shattered. · Households, neighborhoods, and cities are radically changed for the good. · Situations that once meant defeat are turned into victory. · The enemy loses his power over your life. · Your true authority as a believer is unleashed.